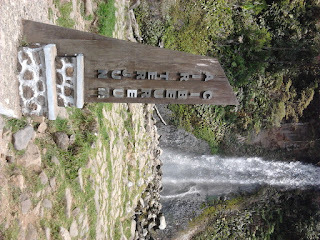 On 28 August 2011 (two days before 1432 H Eid al-fitr), I visited Gunung Gede Pangrango National Park in Bogor, West Java. 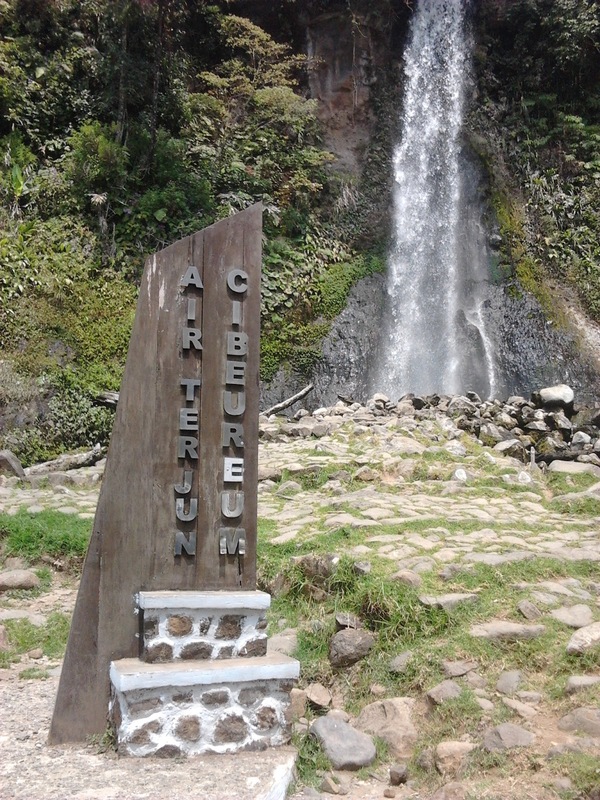 My destination was one of tourists attraction in there, Cibeureum waterfall. The waterfall itself lies in the heart of national park at 1,625 meter above sea level, 3 kilometers from the entrance or one hour trip by foot. Actually my original plan was to visit Cibodas Botanical Garden, also in Cibodas, West Java. The garden located just below the national park. But quickly change up my mind because I found the waterfall more interesting. I began my trip early in the morning by driving to Jurangmangu station, Banten. I took the first commuter train to Tanah Abang station (5.50 a.m.). Luckily the train to Bogor was delayed, so I was able to hopped on train to Bogor (6.24 a.m.). From there I use angkot (local mini bus) 03 to Baranangsiang bus terminal. I arrived at the terminal at 8.00 a.m. and decided to take another angkot 01 to Ciawi. Actually there are mini bus directly heads to Cianjur from Baranangsiang. But I was misled by a blog which told I have to wait longer the mini bus if I wait in terminal. The mini bus have to wait the passengers full (14 people) before its departure. It will depend on how many peole are travelling to Cianjur that day and will cost you time from 5 minutes to hours of uncertainties. Here is a tip. In Ciawi, we have a number of public transportation to choose. There are buses go to cities in West Java which pass Puncak. I think they're cheaper and faster than the mini bus (in normal trip). The mini bus have pros and cons. The pros are they are driven by local drivers, they know the roads. If the traffic congested, they often use right of way along Jl. Raya Puncak to travel. The main problem is Pasar Cisarua which often make long congestion quite stressful. Especially when you have time to catch. The cons are it cost you more expensive than bus, Rp15.000 from Ciawi to Cibodas (the tariff hike up to Rp25.000 in high season). The mini bus used is old and have huge risks in traffic accident. The mini bus which I used to Cibodas for instance have slick tires, packed with 13 people inside minus the baggage. While the ones I used to Bogor have burned brake shoes as it trapped in downhill trip just before Pasar Cisarua. My stop was in Cibodas where I continue to the national park by angkot. The last 5 kilometers brought my memories back. The last time I went there in 2002, when I climbed Mount Gede with my high school friends. It was memorable and fun. 9 years later, the place has major makeover and I barely remembered as place where I visited before. The entrance to Cibodas Botanical Park is further inside. There is a vast parking lot now, just North the entrance. A lot of stall vendors occupied the side of the road to national park. The national park has new information center just next to Mandalawangi Camping Site. The road to national park and golf course is now divided by two. Entered the national park, we have to pay for entrance fee, Rp3.000 for local tourists and Rp20.500 for foreigners. We don't need to present ID card or other document, except if you want to hike to Mount Gede or Pangrango. The road to waterfall is a clear stone footpath with milestones every 100 meters. The signs along the path are clear and useful. 700 meters into the forest we're still can hear the motorcycle engine, but as the path goes higher and deeper into the forest the surrounding sound turned into the shrieks of bird, sighting of lutung (ebony leaf monkeys) and the sound of wind. Surprisingly, a lot of people visit the waterfall as I met some of them. Families trekking, bird watching enthusiasts or just friends gathering groups. One hour later, I arrived at Cibeureum. The views are awesome and the air was fresh, it's worth a visit. But careful, in the regular weekends, this place attract lots of local tourists. After 15 minutes or so, I gained my strength to descent to rangers hut and back to Tangerang. Of course, go down is faster than the ascent. 45 minutes later I'm in angkot heading to Cibodas junction. From there, my trip became easier because I got mini bus to Bogor in short time. But in the road wasn't that good. The traffic congestion in Pasar Cisarua delayed us 1,5 hours. The result was I missed the 2.50 p.m. train to Tanah Abang. I arrived in Baranangsiang at 3.45. Quickly hop to angkot 03 to station, bought a ticket and wait for the departure of 4.24 p.m. train. Because the train continues to Serpong station, I hurried to buy the next ticket in Tanah Abang. I admit, it was quite tiresome and worrisome because we know the train departure. This time the train departed punctually from Tanah Abang at 5.48 p.m. sharp. Finally back in Jurangmangu at 6.24 p.m. I quickly paid my parking ticket and bought some drinks before I drive to my friend house to break the fast.